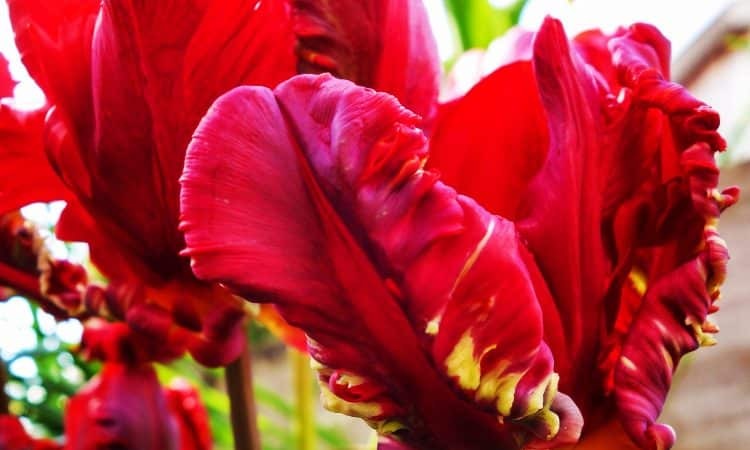 Although bulbs, corms and tubers carry their own food supply it is only good for one year at most and if you wish to have flowers year after year it is essential that they should be well fed. This is especially true of the highly-bred hyacinths, tulips and crocuses and some of the smaller irises. 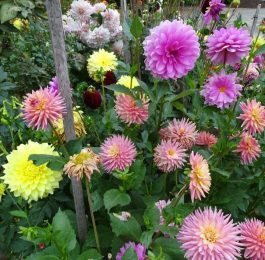 Always prepare the whole of the area to be planted in a bed, do not just dig out the holes, as these may act as drainage sumps in heavy ground, rotting the bulbs. Bonemeal and coarsely ground hoof and horn meal should be added to the soil, and also peatmoss and sharp sand if the soil is very heavy. It is worth making up plenty of such a mixture for putting round the bulbs or corms wherever they are to go. When the ground has been prepared scatter the bulbs on the surface where they are to go and then dig out hole by hole with an ordinary trowel or a specially marked bulb trowel, planting and covering as you go. In this way you will not be digging where you have just planted. In formal planting mark out the distances along a trench. If the bulbs are to go in turf this can be cut out with a special bulb planter after scattering the bulbs in drifts. If the bulbs are small and the turf close it is easier to lift the turf with a turfing iron or flat spade and place the little bulbs on the soil underneath, sprinkling the peatmoss, sand and bonemeal mixture around them before replacing the turves carefully. Do not beat the turf down hard, but it can be watered to settle it. Roughly speaking and if no special instructions are given the depth at which to plant a bulb is not more than twice its depth of soil above it and not less than its depth. Some bulbs make droppers (short stems) to take the new bulb to the optimum depth, others make contractile roots which pull the new bulb down. It may be possible to protect a half-hardy bulb outside from the effects of frost by planting it deeply, but some do not remain there but work their way to the surface. Indoors, plants can be grown in pots filled with ordinary potting compost, in bowls or other undrained containers filled with a specially prepared bulb fiber, which is usually a fibrous or sphagnum peat with crushed shell and small pieces of charcoal, to prevent the fibre from becoming sour as a result of water collecting in the undrained bowl. The fiber has little feeding value, though the bulbs can be fed very carefully with a liquid feed. If grossly overwatered the roots in a bowl will drown for lack of air. If you think a bowl has been overwatered tilt it very carefully, holding the fiber in with one spreadeagled hand and drain off such water as appears. 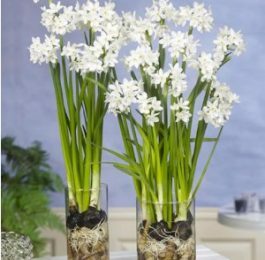 Bulbs usually require a well-drained media and a general compost consisting of 2 parts of loam, 1 part of peatmoss, 1 part of sharp sand, plus 1 lb of bone meal per bushel of mix will suit the majority of bulbs we use for indoor decoration. However, it is often more convenient to use a compost based on peat-moss, which is cleaner and lighter. Plants for the house should be started into growth in a cool dark place such as a cold closet or a plunge bed in the garden. This is merely a flat area on which the pots can be stood and covered completely with about 2 in. of moist peatmoss, sand or washed ashes. 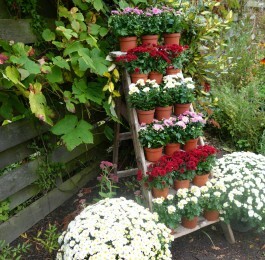 These will fill in the spaces around the pots as well and keep the temperature very even. Boards or bricks can be placed round the outside or the bed can be made in a cold frame. Do not put bowls in a plunge bed out of doors or they may be flooded by rain. It may take as long as eight or ten weeks in a plunge bed before the pots are ready to bring into a warm place. By this time the bulbs or corms will have made a good root system which can take up enough water and food for the emerging shoot. If put into the warm straight away the shoot will often grow faster than the roots can feed it and the plant will collapse. Specially prepared hyacinths can generally be brought into the warmth after six weeks in the cool. The narcissi ‘Paper White’ and ‘Soleil D’Or’ do not seem to be any the worse for being brought straight into the warm if the bulbs have been properly ripened. The planting depths for outside should not be followed inside. Large bulbs are usually planted with little or no compost over the last ½ – 1 in. If the neck of the bulb is above the surface take care not to water into it. Plant the bulbs close, but not actually touching, and choose a bowl deep enough to contain all the roots which will otherwise come out at the surface, or through the drainage holes of too small a pot. Pack the compost down round the bulbs which will shrink as the food is used up and may need top-dressing later on. Leave a space at the top to take the water. A very fine display of daffodils can be obtained by planting a double layer in a large, deep pot. Plant the lower layer about half way up the pot and cover all but the tips of the noses with compost, then stagger the top layer above them so that all the noses have a straight run to the surface. Cover the top bulbs as usual. 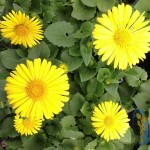 These are planted in pots often with sharp drainage below. Small bulbs should be covered with their own depth of soil and large ones may be only half submerged. Bulbs near the surface are more likely to need careful staking. Bulbs being forced for cutting are often planted in deep flats as appearance is not usually so important. Otherwise they are treated as bulbs in pots. Bulbs for the alpine house or cold frame are usually small; they are often planted in pans but if a plant needs a deep root run a pot should be used. Very good drainage is necessary. Throughout the time that the plant is growing actively it should be fed. In pots there may be enough fertilizer in the compost to feed the plant for six weeks, but after that liquid feeds should be given every two weeks. If a plant makes most of its growth during the winter it will need feeding during this season, even if you normally stop feeding in the fall and do not begin again until spring. Generally speaking the fertilizer used should be one with a rather high potash content to assist ripening which is very important in many bulbs from warm parts of the world. Never feed a plant in dry soil, always water it first. 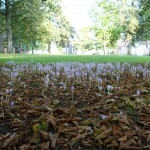 Many bulbs fail completely if they become dry at any time when they are growing, but only plants which are growing strongly need much water in winter as less is lost by evaporation than in summer, and such plants should be watered on the soil only as water on the leaves causes too sharp a drop in temperature and can lead to fungal infection becoming serious. This is the name given to the complex chemical processes which occur inside the plants both before and after the leaves die down. Potash appears to be essential for these changes, as are the gradual withdrawal of water and, in many but not all, baking by sun heat. The plants most in need of this are those which experience drought during their resting period, e.g. nerines. It is important with plants needing sun ripening to ensure that they do not get smothered with other plants, including weeds. Internal changes continue during the resting period and can be adversely affected by incorrect storage temperature. When the leaves of a bulb start to turn yellow watering must stop and the bulb be rested unless experience shows otherwise. All the bulbs, corms and tubers listed here have a definite resting period. Many can stand being dried right out; tulips like a thorough baking. As far as many greenhouse pot plants are concerned the bulbs or corms are best left in the soil in the pot until it is time to start them into growth again. This prevents them withering as much as they would do in the open air and keeps them relatively safe. Plants in the garden should be left to finish their growth before lifting, cleaning and sorting. If they are not to be lifted it may be wise to mark the site. Grass with bulbs in it must not be mown until the foliage turns yellow, nor should the foliage be picked with the flowers. The leaves make the stored food. Bulbs in bedding schemes may need to be moved before it is time to rest them. They can be lined up in trenches to finish their growth. Bulbs which were started in pots and plunged up to their rims in the formal beds are easier to cope with. Bulbs which have been forced for use in the house or for cutting should not be used again for this purpose the following year. Bulbs still in pots can be put into fresh compost like new bulbs, or some of the old compost can be removed and replaced by fresh, or the whole pot ball can be transferred to a larger pot and top dressed. It is usually, but not always, neces­sary to water the soil to start growing. If a pot shows signs of growth it must be watered, but the amount given at first is usually modest.